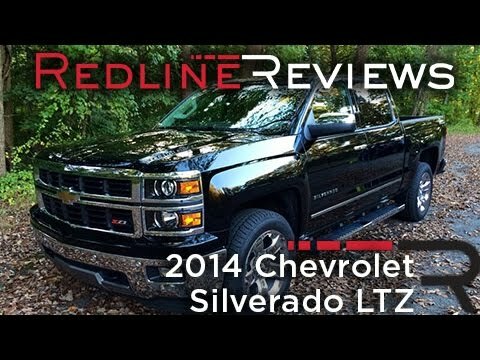 All-new for 2014, the Chevy Silverado bolsters its already formidable appeal with improved utility, ride comfort and in-vehicle connectivity. A trio of bed lengths, cab sizes and engine choices along with one of the quietest interiors in the category help preserve the Silverado's position as a top contender among full-size trucks. Efficient, strong and powerful vehicle. Considering it is a crew cab and that it is a huge truck it has really good gas mileage. It is sleek and beautiful. It was really affordable. It fit our budget fine. We have taken it out on several road trips and haven't had any issues with it. If you are looking for a vehicle that is spacious and luxurious this is the truck you should get. I have always been a Chevy girl and I plan to buy another Chevy in the future. I love that it has a nice middle console to store extra things. The back seats also fold upwards to store things like tools or a gun. I love that it has plenty of outlets to charge your phone or tablet. It syncs really well to Bluetooth and you can hear all the music on your phone. You can also get OnStar installed. Suspension is great and hardly feel any bad bumps in the road. Very spacious in the back for my son and his car seat. It has a step by the door to climb up. Seats adjust perfectly no matter how tall or short you are. Plenty of cup holders and middle space for snacks. Overall it is a smooth ride and my family and I really enjoy our time in it. Chevrolet Silverado 1500 lt. Pickup truck. This vehicle has the latest technology available. The interior is well laid out and very comfortable on short and long trips. The fuel economy is great for a vehicle of this size and weight. It has had a few recalls, but all have been taken care of in a short period of time. I use this truck for towing a travel trailer and I have had no trouble towing in the mountains or on the interstate. Because of its long length, it is difficult to park, but the standard equipment backup camera assists in this area. The standard sound system comes with Bluetooth, which is handy as my state requires hands-free phone operation while driving. Unfortunately, one cannot operate more than one Bluetooth device at a time. It came standard with XM radio capability, which is nice in rural areas with little choice of terrestrial radio stations. The body styling is good and the standard alloy wheels are very stylish. Overall, for the price that I paid and for the standard options, I cannot rate this vehicle less than excellent. Great gas mileage and super comfortable! What I love about my vehicle is it has great features! It has Sirius radio if you choose to have that, you can control the radio from the steering wheel, and it has a screen where you can see the song, or how much gas is left, your speed and other nice things! I also love the gas mileage, it gets so much more than my last vehicle! My other one I would only last a 2 hour trip or just a day or 2. This one I can last a full week! It is also super comfortable, the seats are nice, and the back seat has plenty of room! We currently do have a rear facing car seat and that does take up a lot of space, if it is behind the passenger seat that seat has to be all the way up and if it is in the middle it still takes up a ton of space. But other than that one thing overall I love the vehicle and hope to have it for a long time!